MiniMark sign and labeling vinyl is oftend called "MiniMark tape". 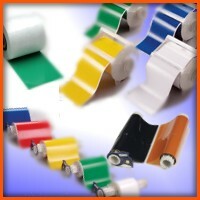 While the most commonly used term for MiniMark tape is "MiniMark Vinyl", many will use the terms interchangeably. MiniMark tape is made specifically for use in the MiniMark label printer. To make sure that the minimark tape is used in the correct printer, Brady incorporates special hardware inside the MiniMark printer, and in the supplies, which allows the printer to operate only when using Brady or compatible cores. Below are a few sample catalog numbers for commonly used Brady MiniMark tapes. These are just some examples of the materials that are available for the Brady MiniMark label printer.